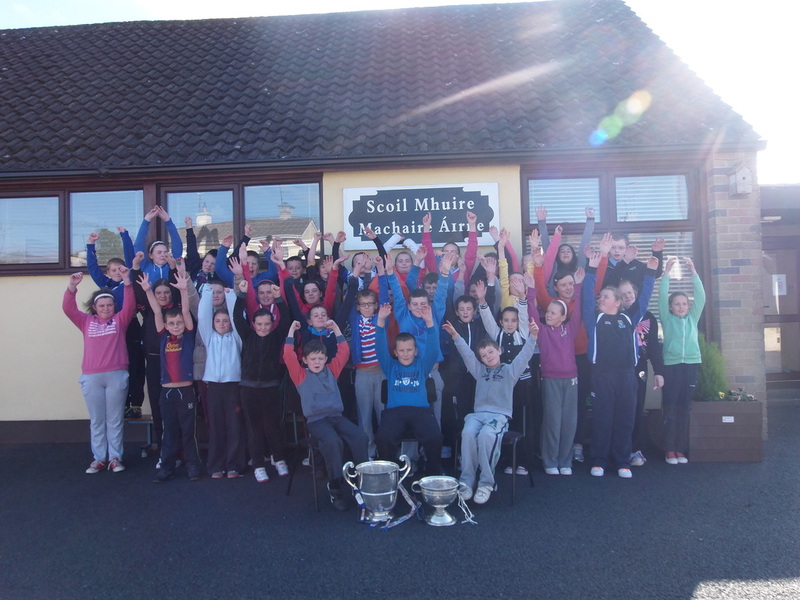 Scoil Mhuire, Magherarney began this year, 2015, working towards achieving the award of the ﻿Active Schools' Flag. The Active Schools' Flag is a programme recognised by The Department of Education and Skills to acknowledge schools that strive to achieve a physically educated and physically active school community by awarding them the Active School Flag (ASF). This year we had our annual Sports Day on Thursday, June 18th. We had four stations in total; The Race Station, The Games Station, The Obstacle Course and The Agility/Skills Station. We also had a rest station where we indulged in some fresh fruit and relaxation as we know a healthy diet plus rest are just as important as exercise for a healthy, balanced lifestyle. At 1.30p.m. we had the presentation of medals in addition to our swimming certificates in our school hall which we shared with our parents. 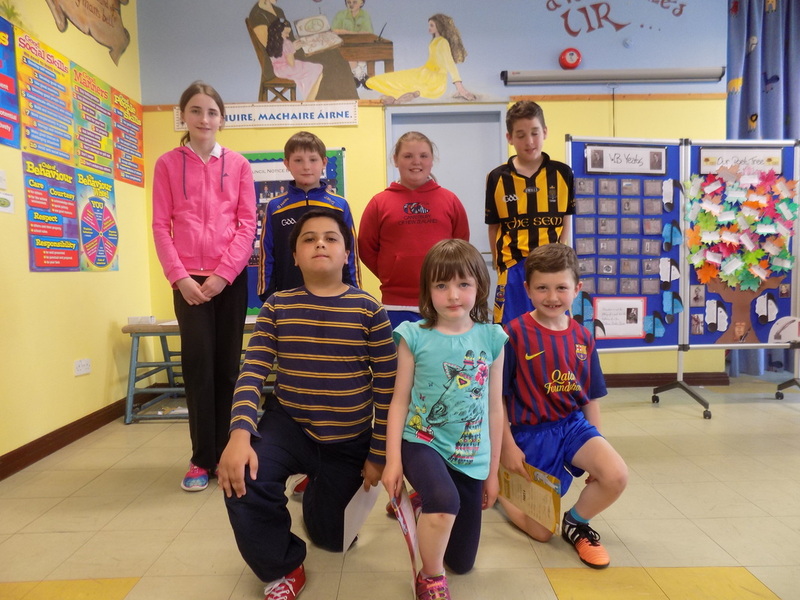 The presentations were followed by the grand FINAL of our recent Lunch-Time Football League. Outstanding football skills were on display in addition to great sportsmanship. 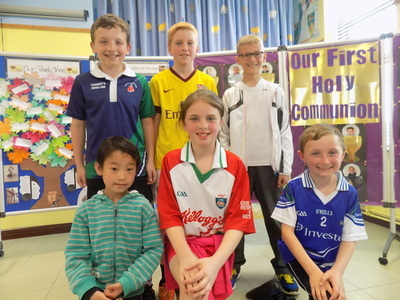 The winning team consisted of: Cónal Duffy, Patrick Lambe, Casey McAree, Nojus Jonaitis, Conan Rooney and Yeh Chew. 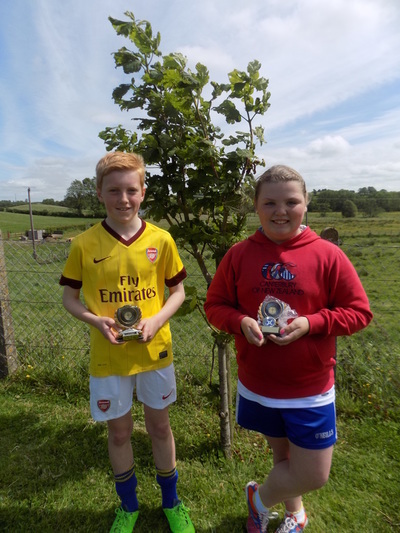 Presentations were also made to the 'Players of the Match' which were assessed not only upon their football skills but also team spirit, stamina, determination and consistency of effort. 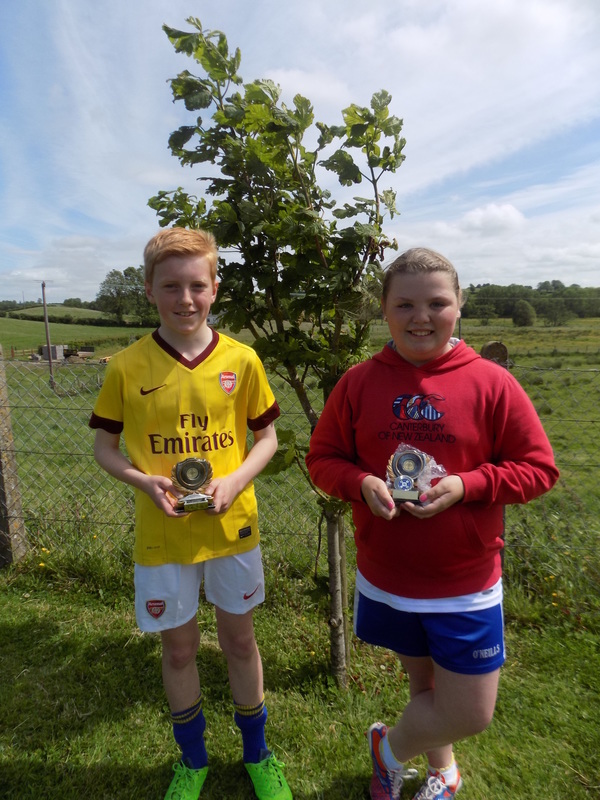 The two outstanding players this year were Amy Lambe and Cónal Duffy. "The Five S's of Sport are: stamina, speed, strength, skill and spirit, but spirit is the greatest of these." This year was the first year that Scoil Mhuire, Magherarney formed a whole school team to attend the Schools' County Athletics Meet which was to be held in The Peace Link facility in Clones. We had great fun completing trials in our own school under the watchful eye of Ms Fahy and it was great that most of the pupils from Rang a hAon to Rang a Sé tried out for the team. A great performance was given by all and we were delighted to have four of our pupils making their respective finals , three of which were medal winners. Be it short or long distance, individual or relay teams, each pupil gave 110% and did their school and their parents proud. 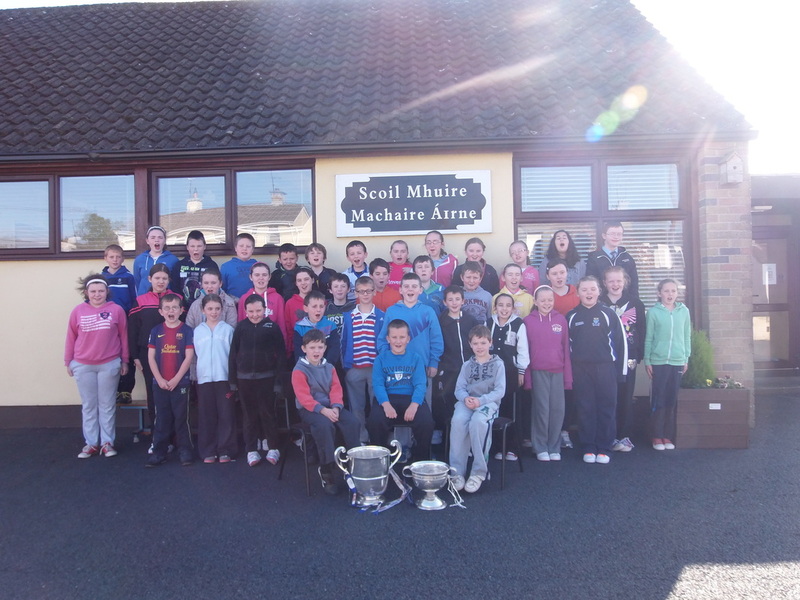 This year we saw a change in how Scoil Mhuire provides for the Aquatic Strand of the P.E. curriculum with the age group being targeted focusing on Rang 1 & 2 and Rang 3 & 4 rather than the most senior pupils. There is much research to support the idea that introducing children to a range of sports at an early age enhances a positive disposition towards having an active lifestyle and one's willingness to trying new sports and activities. While we naturally had a greater number of pupils in the beginner group this year, due to the younger age, we saw great progress in terms of ease and confidence around water as well as an understanding of the importance to respect water at all times and behave in a safe and responsible manner around it. 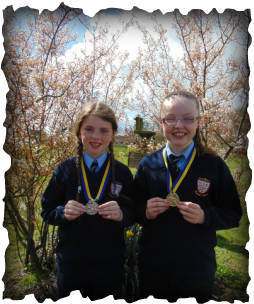 We were pleased to have three pupils, all from fourth class, invited by Monaghan Leisure Complex to take part in their Easter Swimming Gala and there was great delight when two of the participants secured gold and silver medal positions. Maith sibh a chailíní! This year we were delighted to participate in our first ever Cross-Country Meet. Pupils from third to sixth class participated in training at lunch time which culminated in trials for the one day event in Corracrin. What was clearly visible to Co-Ordinator Ms Fahy and class teachers was the enjoyment of all who participated in training and the steady improvement each pupil made relative to their starting level of fitness on day one of training. We were delighted that all the pupils representing Scoil Mhuire, Magherarney on the day successfully completed the full course in what were very difficult conditions. 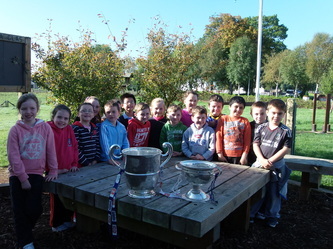 Rang a trí, ceathair, cúig agus rang a sé completed the aquatic strand of their P.E. curriculum from January to February 2014. Various strokes and diving techniques were mastered followed by assessments on the second last day of class. 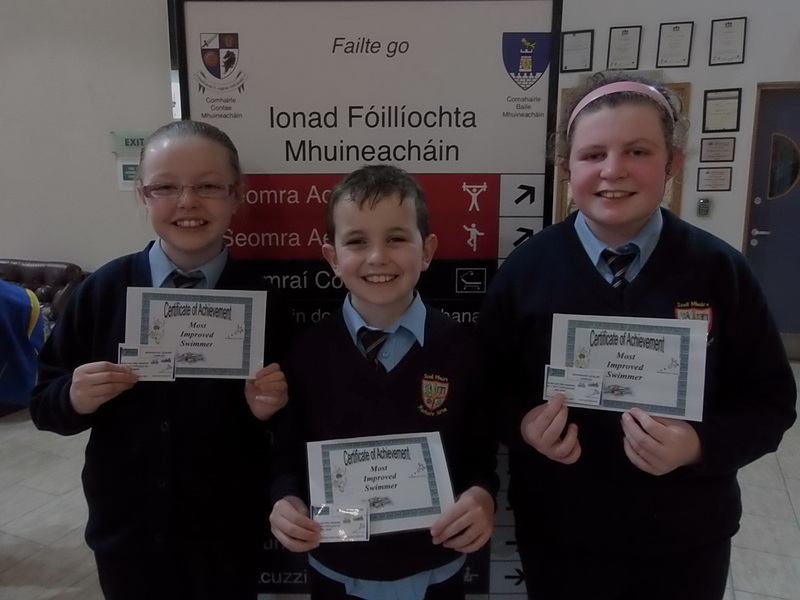 Presentation of graded certificates will take place on Sports Day however our congratulations go to our 'Star Swimmers' from rang a trí agus rang a cúig who were awarded special certificates and free Leisure Centre passes for 'most improved' swimmers. Maith sibh! 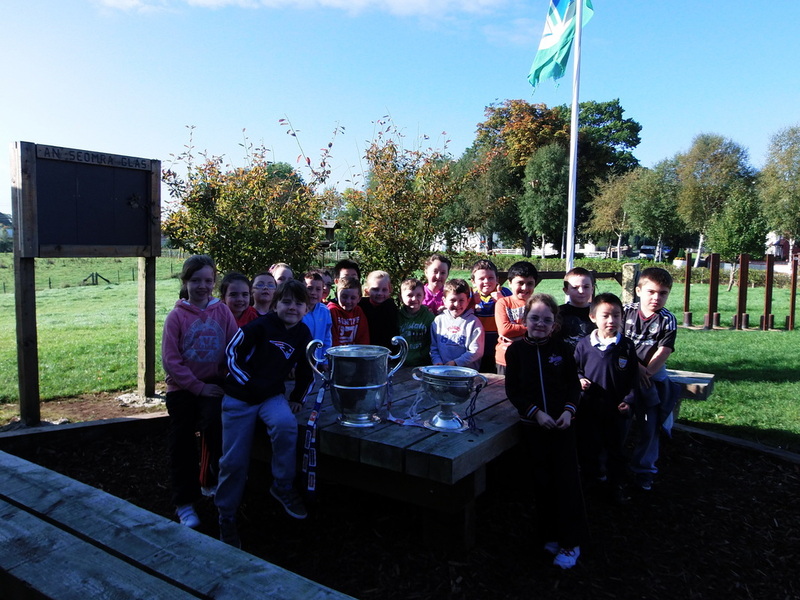 We were very pleased to welcome The Anglo Celt Cup and the Fr. Murray Cup to our school in October. The two cups reminded us of all the excitement this year in Monaghan GAA and of the wonderful sunny, successful summer days for Monaghan County Football. We thank Colin, our visiting GAA coach for organising the visit for us. 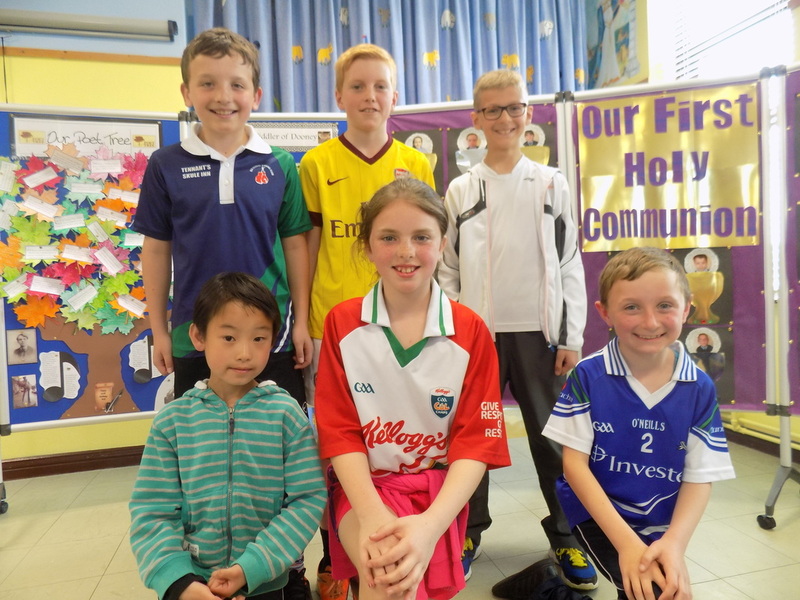 The pupils, both boys and girls, in Scoil Mhuire participate in a number of football events through out the academic year; Cumann na mBunscoil leagues, football blitz and the FAI 5-a-side soccer blitz. Our most recent success was in 2012 when our Senior Girls won the Cumann na mBunscoil Division 3 championship. We are very fortunate that our local GAA CLub, Éire Óg has a great under-age structure in place and many of our pupils proudly wear the blue and gold of the Éire Óg club. Again this year the girls performed really well in Division 3 getting to a play-off for a place in the final. The play-off took place on Wednesday, June 5th on one of the hottest days to date. Our team was victorious in their first match but alas could not sustain this high paced performance for the second match. However we were not in any way deflated. We defended last year's title well, worked as a team and represented our school to the very best of our abilities. Well done to all the girls and their coaches Ms Fitzpatrick and our SNA, Laura Morgan. 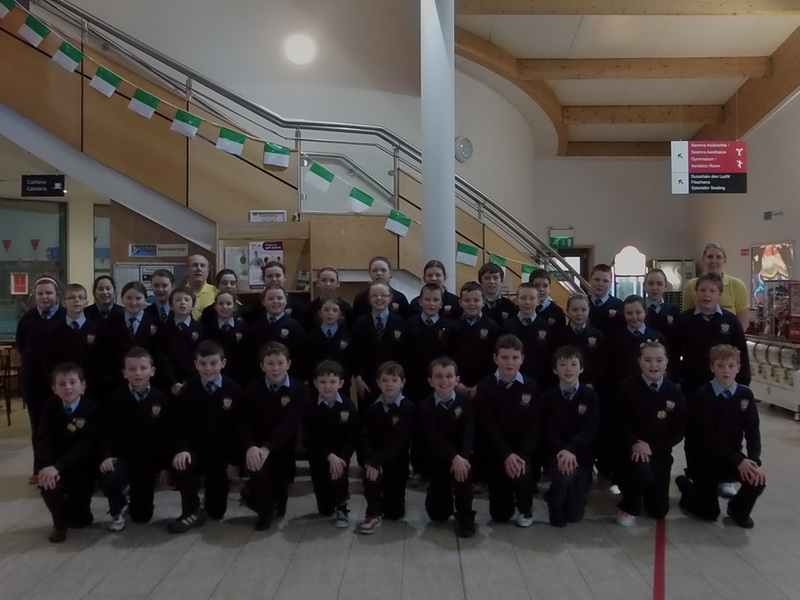 Pupils in third, fourth, fifth and sixth class complete the aquatic strand of the Physical Education Curriculum in January/February each year. The practical part of this strand is completed in Monaghan Leisure Complex while the water safety element is completed by class teachers. pupils in sixth class were charged with designing activities for Infants – Second Class and Third to Fourth class. The success criteria for their Activity Plan was physical activity, skill development, coaching skills and facilitation skills and FUN, FUN, FUN! We are fortunate to have an outdoor play-trail purchased by our Parents’ Association to develop balance and agility that is used at break times by all children, big and small. Fifth and Sixth class linked Active Schools week to their studies in SESE History by looking at Traditional Yard Games played long ago. They are now addicted to marbles! In addition to the above fifth and sixth class completed a ‘Cycle Safely’ course as part of our Active School Week activities. 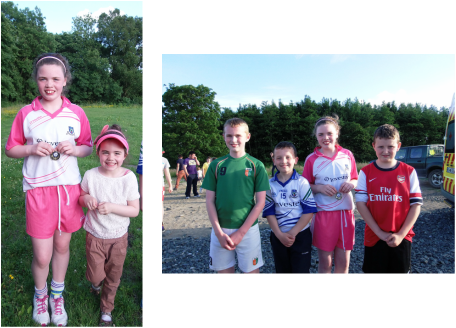 On the 6th of June, Scoil Mhuire had their annual Sports Day. All the children had to slap on the sun-cream, wear their hats and sunglasses as it was one of the sunniest days this summer so far. We had lots of different activities. Third and fourth class had our regular P.E. lessons with Conor and Paul as one of our stations. We also had a games station, a race station and finally a station that was an obstacle course. The games varied such as throwing javelin and target shooting to playing badminton. We had a couple of minutes on each game section. We were split into groups of three at this station. Every game was a lot of fun. The race station was great fun too and very competitive! First the girls from each class did their 100m running race. This was followed by the boys and then the first and second place winners of these races ran against each other in a final. The same happened in the 'spud and spoon race' and the sack race. When we got to the obstacle course we were split into two teams, team A and team B. If you were in team B you started by jumping over hurdles, then a caterpillar slide-pull across a bench, dribbling a ball between cones, skipping 15 times, an army crawl under the parachute, 20 step-ups-step-downs on the bench and finally target practice at the ball and net. If you were on team A you did all this in reverse starting at the opposite end. The juniors also had an indoor station where our yard-time games were set up in the hall. This gave them a rest in our nice cool hall. We had our normal morning and lunch breaks but actually stayed in-doors for these just to have a break from the scorching sun! At half past one we had the presentation of the medals and swimming certificates. Some parents came to watch. We clapped and cheered our classmates. After this there were two football matches on our school pitch. These matches were the quarter finals of our school lunch-time football league. When these were finished it was hard to believe that it was home time. We had lots and lots of fun and we were lucky it was a brilliant sunny day. Contributed by third and fourth class. Competition. The school was represented by Patrick Lambe, Dylan Corley, Lauren Brady and Ryan Corley. All ran very well with great success for Lauren Brady who took the girls' fourth class 100 mtrs title. Our annual school football league ran at lunch time through out the month of June. 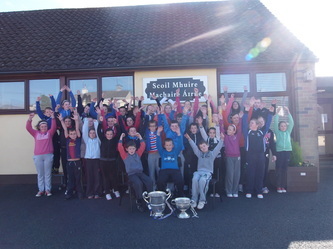 Teams consisted of pupils from first, second, third, fourth, fifth and sixth class. Match officials were taken from pupils in fourth, fifth and sixth class. The league was a huge success showing not only great footballing skill and team spirit but great organisational skills too with match officials running all matches in a fair and efficient manner. Enjoy some photos of the football league final below and listen to a selection of commentary pieces recorded at the final!